On October 13th I started a new adventure in Poland. I had always been reading about the famous Bialowieza forest, untouched by any human hand since 1923. Interestingly the fact that it was the private hunting grounds of the Russian Zar and therefore out of the reach of simple human beings, hunters and poachers alike, contributed to it's preservation up to our days. The Zar liked it's private forest so much that he even build a railway line with a station in the village of Bialowieza, just for his own pleasure and enjoyment. 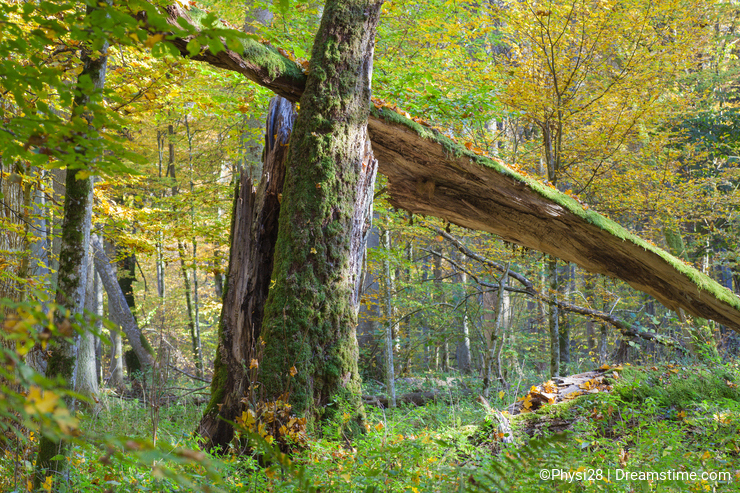 On the internet I learned about Wild Poland( https://wildpoland.com), an agency which offers diverse wildlife photography group tours mainly in Bialowieza, Biebrza and the Carpathians, private taylor-made trips however are also on the menu.I decided to book the autumn photography trip to Bialowieza and Biebrza marshes with the idea of seeing and photographing the impressive European Bison, Elk, Red Deer and hopefully also European Beavers. To be fair, the guys of Wild Poland had already stated in their website that autumn was not the best season of the year to see and make pictures of the big mammals as the animals are normally more dispersed in their territory than for example in winter where the lack of food forces them to congregate at the haystacks provided by the park rangers to help them to pass the harsh polish winters. Next step was to get to Chopin airport to pick up the rest of the participants of this trip: an Australian of Canadian origin, two Dutch (young lady and young gentleman) and a British (delightfully British!) lady. We soon came along very well and felt all very lucky that we got such a phantastic group and group leader plus an excellent driver, (confusingly also called Andrzej).Andrzej took us safely to Bialowieza village in a 4 hours drive with a short stop at a road restaurant where we tasted the probably most representative polish meal: dumplings. The trip had been organized in a 3 days Bialowieza forest and 3 days Biebrza marshes stay. On the last day we were to be brought back to Warsaw and the trip was to finish with a visit of Old Town and a lunch together at a typical polish restaurant. Our time in Bialowieza was very intense: we used to meet at 06:30 in the morning before dawn, take a coffee or a tea and head out into the darkness. Our driver Andrjez and our guide Andrejz (!) were first taking us on a slow tour in our Mercedes van along the dark forest roads, checking for any type of wildlife around. Some time was also spend on some wooden viewpoints which alloved us to oversee the vast meadows in front of the dark, misterious line of the Bialowieza forest. Except of the first day when we were lucky to discover three female adult bisons appearing in the mist we were not too fortunate with big mammals. Our guide explained that the relative drought and warm temperatures had dispersed Bisons and Elks. We did actually spot an Elk but it was rather far away for a reasonable shot with my 90mm, our Dutch and Australian participants however, carrying huge lenses, had better opportunities. However on the dawn of our third and last day in Bialowieza we were incredibly fortunate: driwing slowly through one of the small villages scattered around the National Park we spotted a huge adult Bison male just close to a barn. Freaking out we jumped out of the van and began to walk towards that avesome animal. As our guide Andrzej had previously explained, adult males are generally not afraid of humans and tolerate quite a short distance to them. Common sense however is recommended as they may even charge if they feel that their safety distance has been overpassed. The Bison began to walk towards the meadows under an incredibly scenic low mist with the first lights of the day in the sky while we folloved respectfully till he entered in the forest. There he stayed calmly and began a long and calm process of scratching different parts of his huge body against several logs and branches which seemed to have been used for a long time. We were able to shoot at pleasure, even from 20 meters distance and everybody had his opportunity, even those with a point and shoot camera. 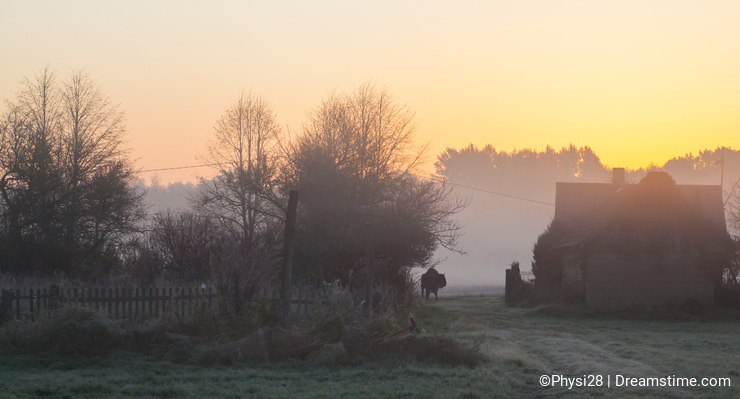 As I mentioned before, the early morning excursions at dawn alloved for some stunning landscape photography while another highlight for autumn colors was the walking tour in the area of Bialowieza which is under strict protection and only available under the guidance of an official local guide. A very friendly young lady led us on a trail through the ancient forest, preserved from human interference since it served as the private hunting grounds of the Russian Zar. Huge trees towering towards the sky while others laying broken down on the ground: the biological process of life was going on in front of our eyes, uncountable fungi grew everywhere collaborating in the newer-ending change of matter into decomposition. The orange, yellow and green colors of the foliage tempted us to shoot more pictures than necessary while the interesting explanations of our two guides kept us fascinated about the close relation of plants with animals, learning about interdependence in life. It was a long walk through the forest, more than 12 km, but we thoroughly enjoyed the day and returned to our lodge with a lot more of understanding about our natural environment than we had before. Early on our fourth day we started our trip to the north, to the Biebrza Marshes National Park.This time we were lodged at a hotel (our base at Bialowieza was a charming guesthouse) with spacious cosy rooms and a good view over the neighbouring meadows. On our way we had the opportunity to make a stop at Trescianka village which is famous for it's Russian-style decorated houses. When the invasion of the German army in Poland during the first World War was inminent, Russian Officials told the people to leave their homes to save their lives, the Germans, they told them, would not spare anyone's life, actually , however, the Russian army did not want the Germans to get any profit from their conquest and later burned down the whole village. The villagers went to exile to Russia where many died of hunger and illnesses. 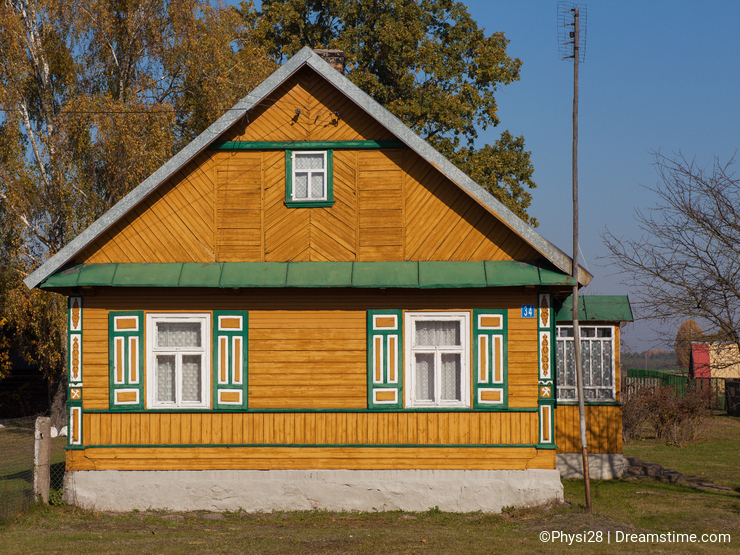 After many years away some of the former Trescianka villagers decided to return to their homeland and rebuild their houses but keeping the Russian decoration style which they were now used to. At Biebrza we maintained our daily routine we were used to from Bialowieza: Early wake-up with general meeting at 06:30 at dawn, first inspection in search of Elk, Bison and Red Deer, breakfast at 08:00, searching for wildlife and stunning landscapes till lunch time, afternoon scouting till darkness made any photography impossible and comfortable and friendly dinners in togetherness with a great ambient and incredible amounts of food.We were not very lucky here as we only spotted an Elk from a very far distance but it was compensated by amazing environments, misty dawns and golden sunsets! A very interesting night-tour we were all looking forward to was the Beaver boat excursion on the Biebrza river. After an early dinner we climbed into our van and drove to a jetty at the Biebrza river, it was pitch-dark and we were just relying on the guidance of Andrzej who knew the place very well. Out of the dark night the boatmen appeared to greet us and direct us to our open boat. It was big enought for at least 10 people so that everybody had space enought to place his tripod and other belongings, having a comfortable seat and a good view. Very soon after starting the ride down-river the boatmen began to scan the riverbanks with their powerful spotlights and it didn't last long till we discovered our first Beaver!They were generally busy swimming near to the banks, collecting grass and reed and transporting small branches with fresh foliage to their hideouts. Some were rather shy while others didn't care much about us, sitting on the sand, scratching their round bellies and looking for food on the nearby meadows. Getting a good shot was a challenge as the night was very dark and I had no flash on my camera, I screwed up the ISO to the limit, tried to keep my camera on the tripod as stable as possible (quite difficult on a boat) and fired repeatedly to try to get at least one sharp image, luckily it worked out because in the end I got two usable photos. Finally, as much as we wished to go on with the trip for a longer time, the moment for our departure arrived. We left Biebrza with the sensation that we would like to come back in another occasion and maybe spend more days with a better knowledge of the area and the important points where to concentrate our attention on, definitely a strong flashlight on my camera would be a must for the Beaver trip! The time to reach Warsaw was hardly two hours as the highway which was under construction when we came had now been opened to the traffic. Once we arrived in Warsaw we began the last part of our adventure in the Old Town. We discovered that Andrezj was not only an excellent biologist but also very knowledgeable about the history of Poland and Warsaw itself. We visited the amazing historic buildings and streets, the beautifully reconstructed traditional houses (Warsaw was completely destroyed during WWII) and culminated the day with a lunch in a typical polish restaurant.Sadly, after that the time for goodbye had arrived, we all had enjoyed a lot with our mutual company and friendship and the whole trip had been enjoyed in a very harmonious ambient. We have stayed in contact since then and I am specially maintaining the contact with our guide Andrezj Petrina, an excellent guide and photographer and more important a good man. Beautiful story, accompanied by very beautiful photos! This report is fantastic! I believe that I will contact you for more information. Congratulations!!! Enjoyed your interesting article! Thanks for sharing! TheSlowWalkers: yes definitive a great place! thanks for commenting! Fstockluk: thanks for the advice, I see I misspelled the name a few times, unfortunately there doesn't seem to be any chance of post editing. Excellent blog Hans. They look like great places to visit. Nice blog Joan and good photo's. I learned something new as I wasn't aware of the European Bison!